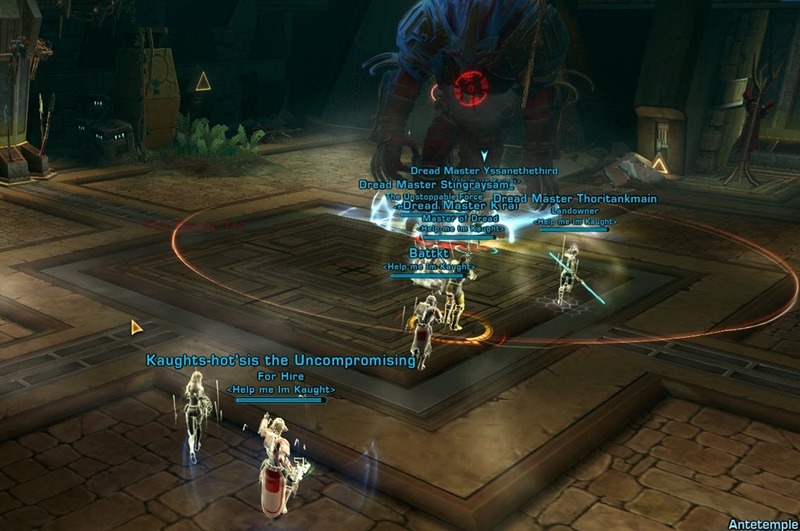 Malaphar the Savage is the first boss of the instance and should be quite easy for your raid group if you intend to progress through the entire instance. The basics of this fight is to get inside his circle to boost your own damage/heals but also increase the damage you take (stacking debuff). Step out of the circle to remove this buff when the incoming damage overwhelm your healers. Adds also spawn frequently and need to be taken care of with the boss’s Spear Toss ability if possible. There are no additional mechanics but the incoming damage per stack of Savagery is much higher, forcing you to step out of the circle at approximately 10 stacks (exact number is dependent on your healers) to clear it before returning inside the circle. Tank swap is needed whenever the adds arrive. Boss and adds have higher HP, and you might hit enrage if you don’t use the Spear Toss red circle on the adds. Savage Flurry is an autoattack of 5m range from both the boss and the adds. It is a fast attack that can hit twice within one second. Malaphar’s attack hits harder than the adds and damage you take from it depends on your Savage stacks (3.4k dmg per hit at 2 stacks). Savagery and Exhaustion are the two debuffs you gain depending on your distance from Malaphar. There is a big circle around Malaphar, stay inside the circle to gain Savagery and stay outside to gain Exhaustion, The two debuffs are mutually exclusive so you can only get one. You gain one stack of the debuff every 5 seconds. The strategy is to stay inside the circle and gain as many stacks of Savagery as you can before the increased incoming damage becomes too much for your healers to handle. In hardmode this is usually around 10 stacks but may vary depending on your gear level and your healer’s ability. The raid leader will need to make a decision pre-pull on what number of stacks to pull out. Once you step outside the circle, you lose all the stacks of Savagery right away and become to gain Exhaustion debuff which decreases your outgoing damage/heals but no longer increase your incoming damage. This debuff is not something you want to keep so as soon as you clear your Savagery stacks, you should go back into the circle immediately. Basically, gain Savagery stacks until heals becoming an issue, then step outside the circle, clear your stacks and go back in. Hammer Smash is a periodic AoE from Malaphar that comes every 5 seconds. 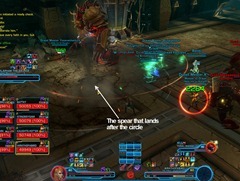 This is your primary raid wide damage (internal damage) that will determine how many stacks of Savagery you can handle. With low stacks, this ability only hits for 5k but with high stacks this ability can hit for 25k (about half of your HP). At 30 seconds into the fight and every 50 seconds after, 3 Feral Massassi adds will spawn with 71k HP each. This is a forced tank swap. Have the main tank swap with the offtank on the boss and then have the previous main tank pick up the adds (Offtank need to ensure they get rid of their Savagery buff before taking on the boss). The three Massassi adds should be tanked outside the circle ideally as this allow the tank to get rid of their Savagery buff. The Massassi adds appear to also gain Savagery stacks if let inside the circle. Their attacks consists of mostly Savage Flurry and Swipe, which has a short frontal AoE. Both attacks are kinetic and do not hit too hard unless they are let inside the circle. Soon after summoning the adds, Malaphar will perform a special Spear Toss attack. 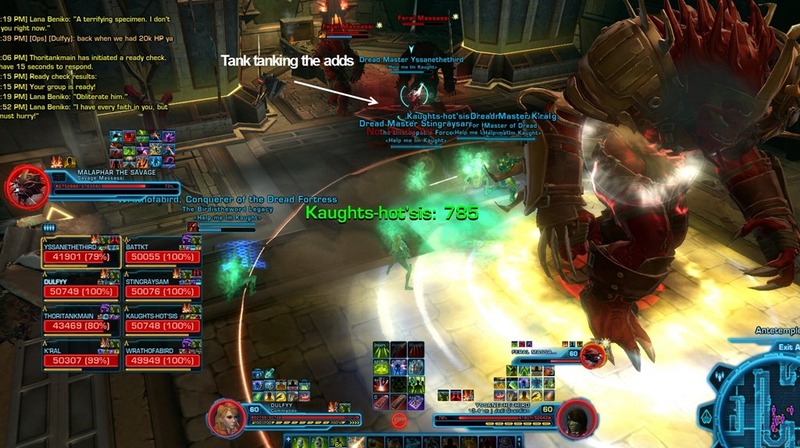 This is a red circle on a random raid target (main tank excluded) that will follow the target for a few seconds. Ideally, the person with the red circle should run it to the adds as the giant spear that lands after the circle will knock down and damage the adds. If your DPS is poor (i.e. you are hitting the 4:20 enrage timer), you should try to do this as much as possible. Unfortunately this isn’t always possible so if you can’t manage to do it, just kite the circle away from the raid. Assign 1-2 DPS to help AoE adds, which is particularly important if you do not land Spear Toss on them. Everyone run in and stand inside Malaphar’s circle. 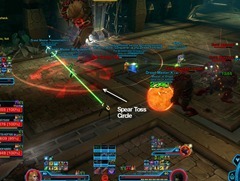 Your raid leader will call out at what Savagery stacks to step outside the circle and clear your stacks. Note that it can take up to three seconds sometimes for Savagery to fall off, so be patient. To maximize DPS, you should clear around stack 10, but this could vary depending on your gear and healer’s abilities. Once your Savagery stack falls off, step inside the circle immediately. In general, the fight is a tradeoff between wanting to gain stacks to do more DPS to Malaphar, and lose stacks so that you do not die to the periodic raid damage. 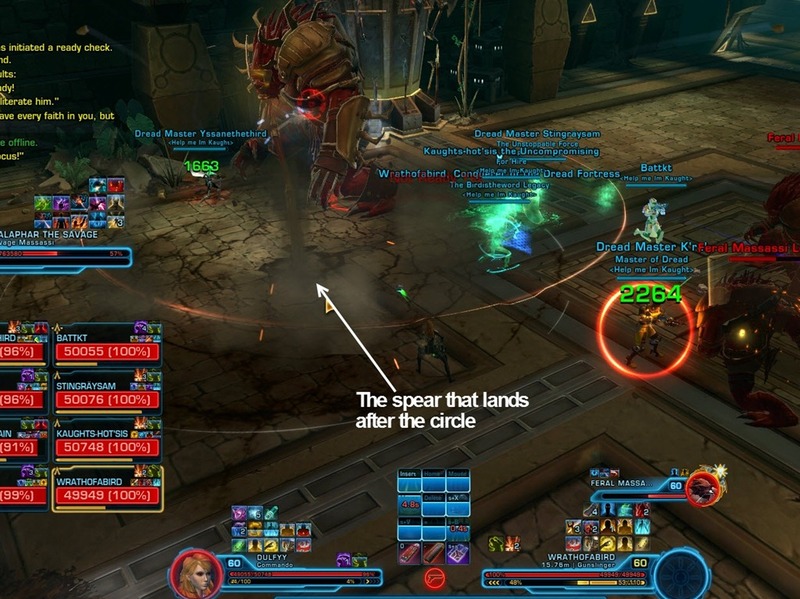 When you receive the red circle (Spear Toss), try to kite it on top of, or near the adds, which will knock them down and deal damage, aiding to kill them quite a bit faster. The first 30 seconds is tank and spank, since the Feral Massassi adds do not spawn until 30 seconds into the fight. Once the adds spawn, have the offtank clear his Savage stacks and do a tank swap with the main tank. The previous main tank will go pick up the adds and hold them outside the circle. Whoever get the Spear Toss circle will need to run into the adds if possible and use the spear to help knockdown and damage the adds. If the adds are not dead, DPS must swap before the new wave in order to ensure the raid is not overwhelmed with adds. We recommend using 1-2 DPS with good AoE in order to quickly eliminate these adds, which also helps out your healers. 50 seconds after the first add spawn, the second group of adds will spawn at 1 minutes 20s into the fight. Do your second tank swap here and do the same thing as your first group of adds. The third group of adds will arrive 50s after the second group and so on. DPS: This is a very straightforward fight to DPS, although the DPS required is quite a bit higher than the first boss in Ravagers Hardmode, Sparky, which does not really have a difficult enrage timer. Make sure you do not get greedy and stay in too long unless you are about to enrage. When you get to higher stacks, rotate your defensive cooldowns. Also, if it is your job to help kill adds, swap quickly to them. Heals: Although Malaphar is not a very difficult fight to heal compared to a few of the other bosses on Hardmode, there can still be a considerable amount of damage to look out for, especially if tank swaps are slow, adds do not die, and if people do not clear their Savagery stacks efficiently. This fight is very AoE heal intensive so with Kolto Probes, Recuperative Nanotech, and Kolto Waves, Operatives excel the most, but any healer should be able to do extremely well since AoE heals are very plentiful in the current tier. It is very easy even for an experienced healer to fall behind in this fight if distracted or if healers spend too much time helping to DPS, so be careful. The only damage done to the raid should be Malaphar’s repeated Hammer Smash ability, so just swap between single target heals on tanks and your big AoE heals. Guardian Leap/Intercede to a raid member who is low on health and hasn’t cleared their Savagery stacks yet before the next Hammer Smash. Rotate your best cooldowns (Enure/Endure Pain, Focused Defense/Enraged Defense, Saber Ward) when you have high stacks of Savagery. Use Rebuke/Cloak of Pain frequently throughout the fight and don’t save it for anything in particular. Rotate your best cooldowns (Force Camouflage, Saber Ward) when you have high stacks of Savagery. 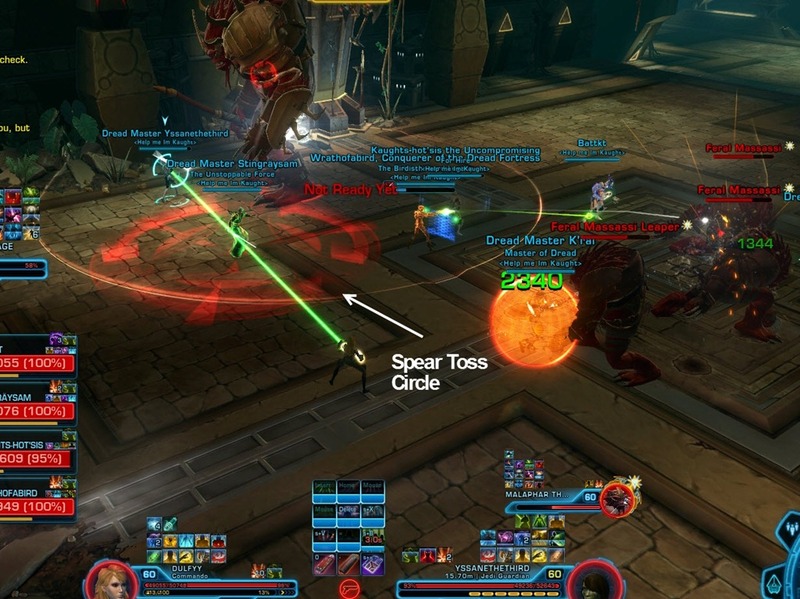 Use Force Armor/Static Barrier on tanks or other raid members with high amounts of Savagery stacks if you do not have a Sage/Sorcerer healer already in the group. You can also use your bubble for anyone targeted with Brutalize. Use Force Barrier if you are below 30 percent health and at 10 stacks or more of Savagery, if you are not sure you can clear them in time before the next Hammer Smash. Use Force Shroud/Resilience to mitigate the Hammer Smash and stay in for a few extra stacks. You can set a Phase Walk outside Malaphar’s circle in order to quickly clear stacks, then Force Speed back in when they are gone. Use Scrambling Field/Ballistics Shield midway into the fight between 5-10 stacks of Savagery for the raid, or if the raid falls behind on killing adds. This should help the healers catch up if they are behind. Ideally, try to place Scrambling Field/Ballistics Shield in a central spot that will cover both the main tank and the rest of the group. As a Scrapper Scoundrel/Concealment Operative, you can Scamper/Exfiltrate to mitigate the Hammer Smash raid wide hit that comes approximately every 5-6 seconds. This lets you keep much higher stacks than others in the raid, although by 20 stacks you are taking a huge risk if you do not clear, which is generally not worth the chance of messing up. By using Scamper/Exfiltrate to roll outside Malaphar’s circle, Ruffian Scoundrels/Lethality Operatives can throw a free instant heal on themselves or a raid member while waiting for their stacks to clear, although you may choose to just refresh DoTs instead. Any Vanguards or Powertechs with the Masterful talent for Sonic Rebounder (reflect shield from AoE taunt) should use it frequently, timing it just before a big Hammer Smash. This can also let you stay in a bit longer before clearing Savagery stacks if you need to increase DPS. Reactive Shield/Energy Shield should be used whenever possible to stay in for an extra Hammer Smash without dying. If you are 10 or more stacks, and below 60% health, you are liable to die if you don’t clear your Savagery stacks in time, so pop Kolto Overload/Adrenaline Rush in advance as you run out. Use Chaff Flare for the extra defense chance or resist, depending on your discipline. Love the content here, but my team does this fight a little different as far as the tanking goes. Mind you, this strategy requires a strong AoE and fairly well geared DPS. We have the tanks stand in the center of the room and switch back and forth from there using the square as somewhat of a binding box. When the adds come out, one of the tanks AoE taunts, bringing them to Malaphar. The DPS on add duty then AoEs on Malaphar or single targets the adds. The person with the spear toss runs it out of the circle. Rinse, repeat. It’s easier to clear stacks and know where the boss is. Tank swap can be a little quicker and won’t be as forced. The tanks can single taunt back and forth without taking as many stacks of Savagery which means less damage. DPS with AoEs continue to damage Malaphar throughout the fight. Shadows can also use resilience to eat the speartoss. This is mainly handy for shadowtanks to get the adds in the speartoss. More damage on the adds = more DPS uptime on the adds = less incoming damage because the boss is dead faster. Are adds guaranteed to spawn from those spots in that order? Hello, is there differences in 8HM and 16HM ? Looking at the Savagery debuff, it doesn’t mention that it increases healing. However, Exhaustion does lower healing. Does this mean that healers should be looking to drop their Savagery stacks more often than DPS?